Three different orders of mammal include at least some species that have returned to the sea. Of these, perhaps the best adapted at the cetaceans, including the whales and dolphins. All cetaceans are carnivores, feeding on various aquatic animals, ranging in size from krill to their fellow cetaceans, and often doing so far from land. Similarly, seals and some species of otter spend much of their lives at sea, and they, too, are carnivores - mostly feeding on fish, although some tackle other prey, such as penguins. This is unsurprising because, aside from plankton, there isn't generally a lot of plant matter far out at sea, and mammals generally aren't as good at eating plankton as fish are. But the third group of truly aquatic mammals are, in fact, herbivorous. These are the sirenians, and there are only four species alive today. Three belong to the manatee family, including one species that lives off the southeastern coast of America. The fourth is the dugong (Dugong dugon), an inhabitant of coastal waters around the Indian Ocean and into the western Pacific. The dugong is the only living member of its family, and, like manatees, it inhabits shallow waters because there, the sunlight can reach the seabed and permit the growth of the seagrasses that it eats. However, as is so often the case, dugongs represent the last surviving member of a family of animals that was once larger and more widespread. Once we include extinct species, we can divide the dugong family into three subfamilies. One includes the living species, and a number of close relatives, while a second includes Steller's sea cow (Hydrodamalis gigas), a species that fed on kelp, rather than seagrass, and only disappeared in 1768. The third consists of more primitive animals, and is though to include the ancestors of the more modern subfamilies. Which, of course, means that, technically, it isn't a real group of animals - in biology, you're not allowed to ignore the descendants of something when you're defining a group. While they may have been primitive in comparison to living species, these dugongs were successful in their day, surviving for millions of years across wide parts of the globe. One of the best known genera is also the last, Metaxytherium. The exact number of species within the genus is open to debate, since it can hard to tell fossil species apart, However, we do know that the various members of the genus lived in the Mediterranean, the Caribbean, and (since Central America was still a chain of islands at this point, and easy to swim between), also along the Pacific coasts of the Americas. Most of the known species lived during the Miocene, a relatively warm epoch in the second half of the Age of Mammals. However, at some point during the late Miocene, the Metaxytherium species living in the west all died out, although possibly not before giving rise to the ancestors of Steller's sea cow, which lived in the north Pacific. That left only the Mediterranean species, although they likely also lived in the Paratethys Sea, a more north-easterly body of water that survives today as the Black and Caspian Seas. By the time of the Pliocene, a cooler epoch that preceded the Ice Ages, only one species survived, Metaxytherium subapenninum, which seems to have died out a little under 3 million years ago. We have a number of fossils of this animal, mostly from Piedmont and Tuscany in northern Italy, although there are some probable remains from Spain as well. A recent review by Silvia Sorbi of the University of Pisa, and co-workers, looks in some detail at what we know and can deduce about this, the last of the "primitive" dugongids. 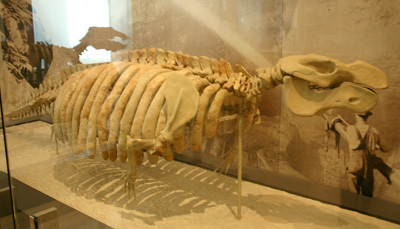 In many respects, M. subapenninum probably looked much like modern dugongs, a large, heavy bodied animal with fore-flippers and tail flukes, and no hind limbs. However, it was likely quite a bit larger. While we don't have any skeletons that preserve the entire length of the vertebral column, the best specimen we do have suggests an animal about twelve feet long, and probably weighing something like half a ton. Significantly, its front teeth were still growing, implying that it was still young, and may not have been fully grown. That's supported by the size of some other skulls, which imply that the largest individuals may have grown to fifteen feet or more. Not much compared with most whales, perhaps, but larger than any living sirenian - or all but the largest of dolphins, for that matter. When we try to compare this species with others from the same genus, an interesting pattern emerges. It's closest relative appears to be M. serresii, to which it is remarkably similar, apart from a larger size and more prominent tusks (more on those later). What's significant is that this is also a Mediterranean species, and that it lived during the late Miocene. Given that the two species are never found together, that the latter appears to have died out immediately before the former, and that both represent the only animals of their kind in the Mediterranean at their respective times, it's hard to escape the conclusion that M. serresii is the direct ancestor of M. supapenninum. 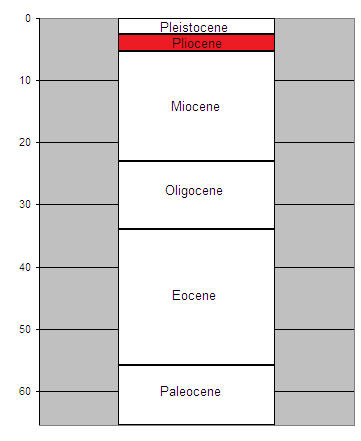 While the exact relationships within the group get a little more muddied after that, with a number of Caribbean and Pacific forms clouding the picture, the next most related Mediterranean species seems to be M. medium, which lived in the mid Miocene, and, after that, M. krahueltzi from the early Miocene. Again, none of these forms overlap in time, that we know of, suggesting a linear relationship. This is unusual, because we normally don't get such a clear picture of evolutionary relationships. Usually, we can just say that two species lived at different times, and are quite similar. For example, the familiar picture of horses evolving from the primitive four-toed Hyracotherium, through three-toed forms, to the modern single-toed species, isn't a direct chain of evolutionary descent, but rather a sampling of increasingly horse-like forms that developed over time. But here, it seems plausible that we can actually say what led to what, and the way that the species change over time seems to support that. We can't, of course, be certain. There aren't a huge number of fossils for these animals, and it's always possible that there are more out there we haven't seen yet, but the picture we do have looks unusually clear, and the animals are gradually changing over time, just as we might expect them to. One of the features that we can see changing in this apparent lineage is the size of the animals' tusks. The presence of tusks is one of the ways that dugongs differ from the better known manatees. Manatees have no front teeth at all, plucking seagrass with their flexible lips and then grinding it up with an array of chewing teeth at the back of the mouth. Dugongs, however, have a set of front teeth, two pairs in the upper jaw, and four in the lower. Most of these are small and of little utility, and they drop out before the animal reaches adulthood, but one pair of large, tusk-like incisors remains in the upper jaw. As a digression, incidentally, it's worth noting that the cheek teeth of dugongs and manatees are also pretty interesting. Overall, there are six in each quarter of the jaw; three premolars and three molars. But, at any given time, there are rarely more than three. What actually happens is that the teeth wear down over time as they grind up tough food, and the ones at the front eventually fall out, to be replaced by the tooth behind them. At the same time, a new tooth erupts at the back of the row, and slowly pushes forward through the jaw as the animal ages, in a kind of conveyor belt pattern. The final two molars stay put once they reach the front of the row, since there's nothing to replace them. This is a pretty weird arrangement; most other mammals whose teeth are in danger of wearing out have them continuously grow to counteract the wearing effect. However, it's not entirely unique, and is also, for example, what elephants do - although, in their case, the final teeth do eventually fall out as well, so that the animal dies of starvation. It may be worth noting that, in the grand evolutionary tree of mammalian orders, elephants are among the closest living relatives of the manatees and dugongs. Anyway, back to the fossils. The early forms of Metaxytherium, and those living beyond the Mediterranean, all had small tusks, and one species may not have had any at all. However, they are larger and more prominent in M. serresii, and larger still in the very last species, M. subapenninum. Indeed, the largest tusks are found in the youngest known specimen of that species, dated to just before the start of the first Ice Age. That, in itself, may be a reminder that species don't stop evolving, and that there is often a gradual change over time even within a single species - something that has often been observed in other animals. (On the other hand, judging by the number of cheek teeth left in the jaw, the fossil in question does appear to belong a particularly old individual, so it could just be a coincidence). So why did it have such large tusks, when its ancestors had done perfectly well without? In living dugongs, only the males have true tusks; the teeth are present in females, but don't erupt through the gums unless the animal gets particularly old, and often not even then. As is so often the case when male animals have something large and pointy that the females don't, they use the tusks for fighting with one another, and showing off their prowess to females. The obvious conclusion would be that that's also true of Metaxytherium. But if that's true, all the fossils of M. subapenninum ever found must be male. That's not completely impossible - it's not as if we have a huge number of fossils to examine - but it does seem fairly unlikely. Assuming that all the fossils of the older species aren't female (which seems even less likely) then there must be some general purpose that the later forms needed tusks for that their ancestors didn't - and it can't have been inter-male fighting. The early, small-tusked, species all also had rather narrow, down-turned snouts, and it is suggested that they used these to feed on the roots of small sea-grasses, such as common eelgrass, along the sea bottom, as well as the leaves of the larger Neptune grass. But then, something rather dramatic happened to the Mediterranean: the Straits of Gibraltar closed up. This had, in fact, happened before, but previously, it had made little difference, because the sea connected to the Indian Ocean through a set of straits running across the Levant from south of Turkey through to what is now the Persian Gulf. But this time, the Mediterranean became entirely closed off, turning into an inland sea... and began to evaporate. It never entirely vanished, but it was greatly reduced in size, and, like the Dead Sea, became increasingly salty in the process. Since it wasn't, at the time, as severe as the conditions in the Dead Sea, that wasn't a problem for the dugongs, or for the eelgrass whose roots they ate. But it was a problem for the Neptune grass, which is more sensitive to salt levels, and began to die off. Without large leaves to eat, the dugongs switched to eating more roots, and larger, sharper, tusks helped them do that. The climate also cooled, as the Ice Ages loomed, and the increasing size of Mediterranean dugongs at this time might be an example of Bergmann's Rule in action. With time, the Straits of Gibraltar opened up again, and the Atlantic rushed in, allowing the Neptune grass to come back with a vengeance. With the climate steadily worsening, there was less to eat, and the dugongs could have found themselves forced to eat more nutritious, but difficult to acquire food: the roots of Neptune grass were an ideal candidate. They couldn't eat them before, because their jaws weren't really suited to it, but having been forced to eat little but roots anyway for the last few hundred thousand years, they now had the tusks to enable them to make a go of it. The tusks grew further, into the large, sharp ones seen in M. subapenninum, an their snout also changed shape, to a more solid form better able to resist the forces of chewing tough food - something seen to an even greater extent in living dugongs. It wasn't to last; the climate grew worse still and, eventually, the last of dugongs died out as ice sheets swept across northern Europe and even the Mediterranean became chilly. No longer with any grazing animals to keep it at bay, Neptune grass flourished, and today, while declining due to pollution, it remains by far the most common form of seagrass in the area.